Paleontologists have recently suggested a theory that the large sea animal on Cambrian period has giant eyes and an excellent vision. The reason for this statement was 3 centimeter large eye imprint of the giant sea predator found earlier this year. The size of the giant fish was about two meters, with oval body, flexibly moving body which allowed it to swim in the water and huge whiskers used for obtaining the food and breaking apart other small inhabitants of the sea. The fossils of the giant Cambrian Anomalocaris were found in Australia, in the Emu bay of the Kangaroo Island and were approximately dated 515 million years ago. That is the middle of the Cambrian period when Anomalocarises and similar animals were living on the Earth. Paleontologists had already enough information about the predator’s body and its constitution. But the structure and the type of the predator’s eyes was not yet clear. However the imprints show that the structure of the Cambrian Anomalocaris’s eye pretty much looks like the contemporary cancroids’ eye. The surprise was that it had about 16 000 individual lenses – much more than many contemporary animals have; each was responsible for the vision of 1 angular degree – less than animals surrounding us have. The curve of the predator’s eyes and the knowledge we have concerning modern compound eyes, scientists think that the giant animal had an excellent vision. 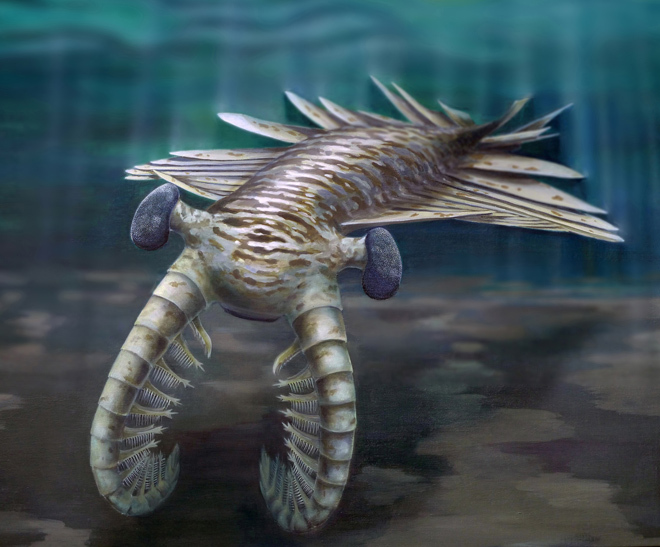 According to paleontologists, the Cambrian Anomalocaris was acting in the daytime and sleeping in the nights, it was chasing in the well illuminated water.